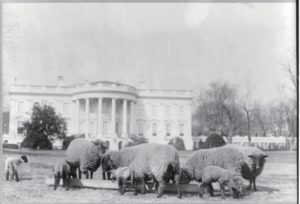 It’s almost impossible to imagine now—sheep grazing on the White House lawn, tending their lambs and grass with care. Perhaps just as unfathomable is that this scene was organized and made possible by the First Lady. But in 1917, Edith Wilson and her husband, President Woodrow Wilson, strove to be the “model American family helping the war effort.” Mrs. Wilson was the President’s aide and confidante in supporting the troops who departed American shores to fight alongside the Allies in Europe. She organized war bond rallies featuring celebrities like Charlie Chaplin and Douglas Fairbanks and volunteered at the canteen at Union Station, where soldiers departed for the warfront. Woodrow’s daughter Margaret Wilson sang to raise money for the troops. In addition, the entire family observed wheatless Mondays and meatless Tuesdays. Mrs. Wilson was one of several First Ladies to stand out as a quiet hero whose simple yet meaningful actions made lasting impacts on the American home front. 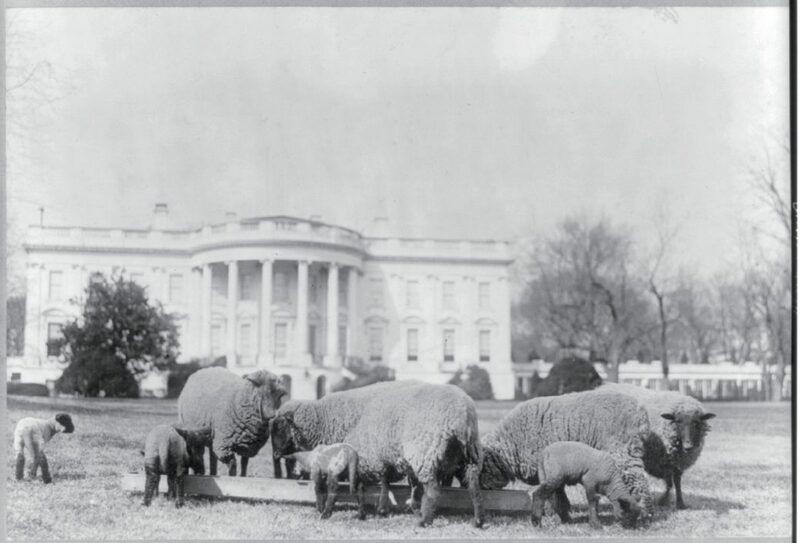 Her use of the sheep and her adoption of meatless and wheatless days in the White House spurred many American families (especially those in the middle and upper classes) to plant gardens and observe meatless days. Furthermore, one pound of the White House sheep’s wool sold at auction, netting $52,823 for the Red Cross and the war effort. In 1941, when the US once again entered into war against Germany, tales of horrendous food shortages in Europe reached American shores. Americans were asked to rise to the challenge of feeding the Allied troops and countrymen amidst a war-torn Europe. Leading the charge was Eleanor Roosevelt and her husband, President Franklin Roosevelt. Mrs. Roosevelt had long been intent on creating nutritious, low-cost meals. After one dinner, she boasted that the meal had been “two courses for only seven and half cents per person, including coffee.” Determined to lead by example, the Roosevelts actually fed themselves and their guests on a ration booklet just like any other American family at the time. In addition to being a columnist and journalist, Mrs. Roosevelt planted the first White House victory garden, encouraging countless households to plant their own. In part thanks to her contribution as a figurehead, her husband was later able to report that 42% of the nation’s fresh vegetables in 1944 came from victory gardens. Both Wilson and Roosevelt became figureheads for meatless days. Their work as First Ladies and leaders of the White House household inspired countless Americans to change the way they shopped and ate. Today many Americans earn less than minimum wage, and do not have access to fresh, healthy food, and environmental degradation and climate change threaten the farmers and food producers of the world. First Lady Michelle Obama worked to highlight food deserts and food access issues, to fight against large food companies’ control over our diets, and to encourage healthy eating among young and disadvantaged youth. In a time when few people have gardens, Mrs. Obama replanted the White House’s vegetable garden—which had lain largely dormant since Eleanor Roosevelt’s victory garden—and advocated for healthy, nutritious food in schools and homes. The garden was originally planted with the help of 23 fifth-grade advocates from Bancroft Elementary who had started a garden at their own school. White House meals often-featured vegetables from the garden, much to the chagrin of the First Daughters. From these First Ladies, we can see the fruits of leading by example and learn about effective forms of leadership during times of trouble. The efforts of Edith Wilson and Eleanor Roosevelt steered the country through times of trouble by practicing what they preached. They ate meatless, economized, and planted gardens. The modern-day work of Michelle Obama has brought food scarcity and health issues to light. Because of the leadership of these women, early meatless days were more successful and widespread, and contemporary food issues are becoming a part of the national conversations around equity and health. Let’s hope for more leadership to come.